Although Hakata may have undergone a drastic change over the years, the people’s hearts remain the same. The open and unconventional Hakata temperament has been passed down together with many festivals and traditions, making Hakata a hometown beloved by the people that live here. The life and culture of Hakata, mainly of the Meiji and Taisho eras, are introduced from various perspectives at this Museum. Enjoy for an exploration into the heart of Hakata. 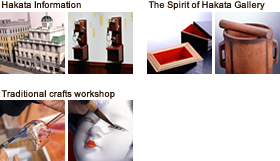 Here you will find the many faces of the Hakata way of life. This superb example of traditional architecture has been moved here and restored to provide a glimpse into the past. You can pick up traditional craft items here as gifts or souvenirs. *July and August will be open 9:00a.m. Souvenir shop will be open 10:00a.m. Closed Fourth Monday (or the following day if fourth Monday is a national holiday) *Souvenir shop will be open. 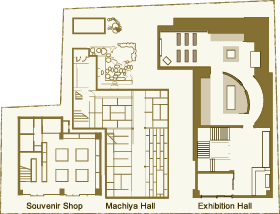 ・Admiddion to Machiya Hall and the Souvenir shop is free. ・Please refrain from eating or drinking. From the Airport 7 minutes by subway and 5-minute walk from Gion Station, or a 15-minute taxi ride. From JR Hakata Station A 15-minute walk or a 5-minute taxi ride. From Tenjin 4 minutes by subway and 5-minute walk from Gion Station. By bus, a 5-minute walk from the Canal-City-Hakata bus stop. Copyright © 2013- Hakatamachiya Furusatokan. All Rights Reserved.